Adaptations of board games, for better or for ill, generally have to be faithful to the original. And so it is with One Deck Dungeon, a game that toes the line between “Yeah, that’s fair” and some good, old fashioned table flipping. You might be unsurprised to learn that dice are heavily involved. But let’s get into that. If I’m clever, and my Black Die of General Usefulness roll well… I can still take it. Let’s do this. Where does the change come in, the challenge from trying different things? 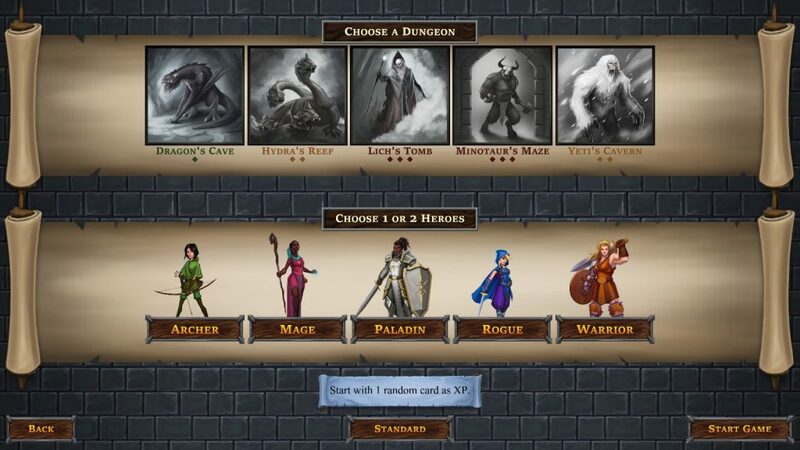 Well, mainly two sources right now: The Adventurers (each with different values of stats-as-dice, in five flavours, and different skills if you play single player or two player) and the Dungeons (Each of which has a different boss, and different, stacking “Bad Things” per level.) My Warrior has, generally speaking, had a good time in the beginner dungeon (even getting me my sole win so far), but, due to a variety of factors, from 2s magically disappearing because of a Weakness Curse to magic based armour and damage, hasn’t done so well in, for example, The Lich’s Tomb, or against the Yeti. So… Everything is understandable, at a glance, and this is good. You would think, at this point, that I’d then point to the dice and cry “BULLLL!” But no. Mainly because, while victory against a boss is only assured if you’re both good and a little lucky (and, in cases like the Yeti, heavily weighted toward hitting things while also having some dice to take care of, say, Magic and Agility), getting to the boss is, generally speaking, okay. 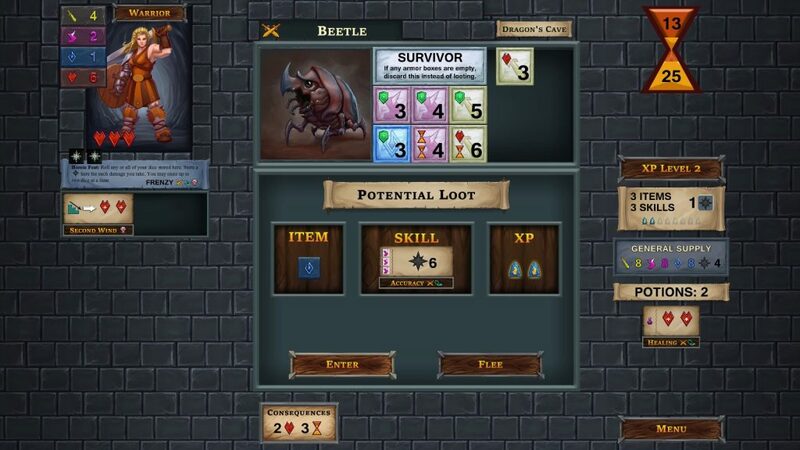 The majority of the dungeon deck doesn’t change, as noted, so there’s a careful balance between taking damage to Get Cool Stuff (XP so you can hold more stuff, potions so you can live long enough to get stuff, or use special abilities in your quest to get stuff, stuff adds to your dice, skills to more easily turn crap dice into good dice, so on so forth) and knowing when it’s good to Just Run (The Wraith, for example, I generally avoid or potion out of if I can. No stuff for you, mister Wraith, only meeeee.) 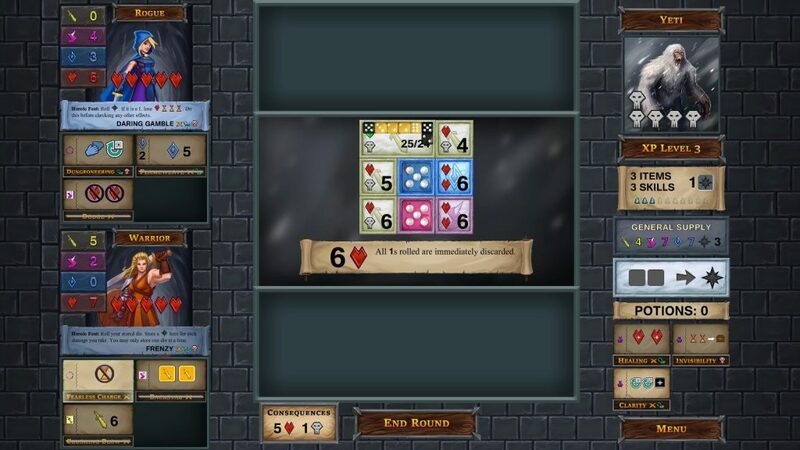 The feeling of being fair is important, and, for all that it is, at its core, a game about rolling dice and hoping for high numbers, One Deck Dungeon mostly feels fair. Could it be more fair? Quite possibly. As implied, without a bit of luck, some good stats, and preferably a potion stashed away, the bosses of each of the five dungeons will mercilessly muller you. But then again, I’ve come so close… So close… So I know that these bosses can be killed, they can be beaten. Is it fair enough to keep me coming in without a friend to play with? Maybe. It does have a two player local mode at the moment, with each player’s stats and Heroic Abilities halved in effectiveness, but a good mix (Warrior/Rogue, for example, has served me well so far in Yeti’s Cavern) goes a long way, and that “X skills/items per character” wears thin slower (normally, in a single player run, I don’t bother going for items on higher floors.) I can even build synergy, so it helps. Overall, One Deck Dungeon explains itself and its rules quite well, seems mostly balanced and fair (for a given value of fair), and, if there were anything I’d maybe get tired of, it’s the main dungeon deck. Oh, right, another Goblin. Two flame traps in a row? Yaaawn. Still, it’s an alright pick if you like two player local play, or a single player game where you’re relatively free to expand your tactics in interesting directions. We’ll see how that progresses as time goes on. 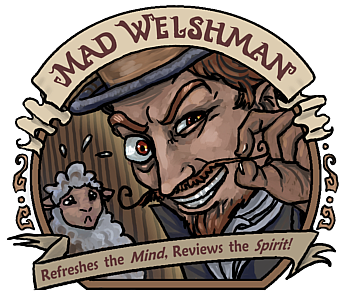 The Mad Welshman appreciates well how the appearance of fairness is just as important as actually being fair. The game, thankfully, is both.